Yesterday started misty, which made for pretty pictures. Soon the wind picked up a bit - from the southeast - and the sun came out, and we got busy launching. Everyone was far too busy enjoying ridge running to take photos, here are a couple. For our gastronomic readers, last night a contingent went to Hay on Wye for what was reportedly a very good curry. Today the ridge was again working well, and there was wave down the Cwmdu valley in which 118 climbed to dizzying heights. There will be photos later on, right now we are too busy. .........the gang assembled yesterday for Booker's spring expedition as guests of Black Mountains GC. The day started calm and misty but as the haze cleared the wind picked up and by the time Richard had his check with the locals it was blowing a nicely turbulent easterly which made him work a bit. After that we rigged the K21 and Richard spent the rest of the day putting us through our paces. Considering he had got up at 4am to drive down it's surprising he stayed awake. 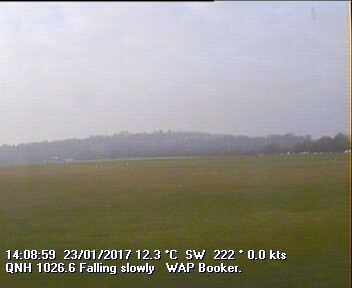 A number of members on the trip have so far only flown at Booker so they really enjoyed the experience of working out how to fly their circuit at a new site - and in challenging conditions. Ruth was still smiling when she landed. After the toys had been put away the team dispersed to their various lodgings. Dinner was slightly delayed for the Treasurer who found himself spending rather longer in his bath than he had planned. Maybe in future he had better take his phone with him. Jim's forecast of blue thermals was spot on but with the added benefit of some wave thrown in which when in sync with the thermals gave extremely strong lift of 8/10 knots and was only capped due to airspace constraints. The visibility improved throughout the day and in spite of the challenging southerly wind there were several soaring flights in excess of an hour and pilots only coming in to land to allow others the chance to enjoy the soaring which went on until late in the day. There was a good turn out at the AGM last night. The Treasurer presented a very positive report, then Geoff Tabbner gave his 5th and final report as Chairman. He reflected on the challenges the club has surmounted in the last few years - stadium, closure of runways, rent reviews - and on the progress the club has made in establishing and developing Booker as a club which has fun in a safe and supportive atmosphere. He also noted the large number of members who give their time and skills for the benefit of the club. He was presented with a particularly nice bottle of wine, and his wife Ann received a bouquet in recognition of her support for Geoff in all the time and effort he has expended for the club. Geoff then presented a bouquet and leaving gift to Hilary Binner who has devoted 8 years to working with Shelagh in the office to keep us all in line and ensure that everything runs smoothly. Four new committee members were elected - John Sugden, Mark Wolff, Hugh MacDonald and William Parker - and then Denis Campbell reported on the changes to the ownership of the airfield and the opportunities this presents for us. The evening ended with wine and beer - is that why not many turned up at the launch point this morning? Today looked promising for some early cross country so Nils the Weatherman (EN) and Geoff (949) rigged - and then joined the rest on the bus to watch hail hammering down. It was remarkably turbulent, an excellent day for check flights and brushing off the winter rustiness, and - if you got the right bit of the cycle - very thermic. 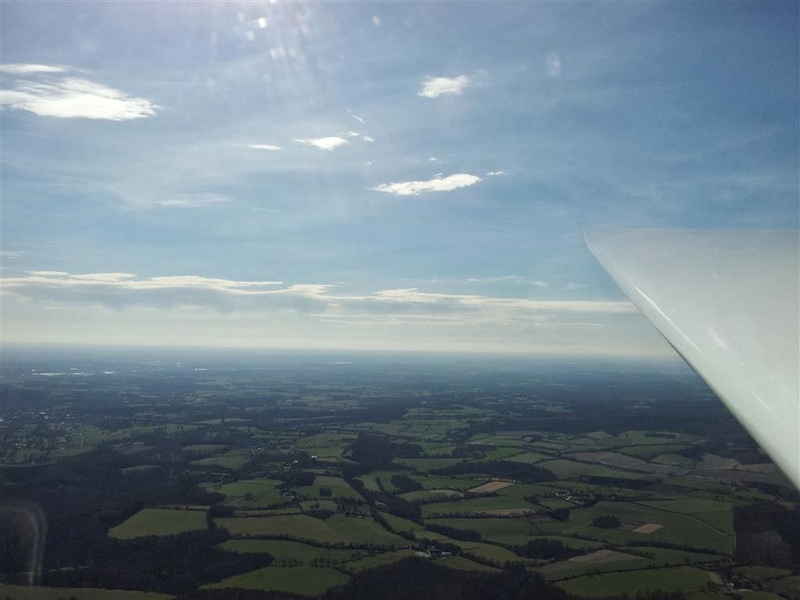 With the Spring Equinox only a few days away, the recent run of good weather has seen many faces and gliders coming out of hiberntion. Memories of the wettest winter for many years are probably starting to fade (even though the number of flooded fields and standing water easily visible when flying are a sharp reminder of recent events). The Bronze C lecture on Operational Performance was given by Mike MiniGat Gatfield and was well received by all who attended and who commented on how good it had been. The launch point was very busy over the weekend and saw a good mix of wave on Saturday with many members enjoying 2/3 knot climbs in wave around Turvill until the airspace got in the way and then on Sunday there was lots of good thermal soaring to be had with flights in excess of 2 hours being recorded in some excellent visability (there was also a little wave around as well). Monday produced the first 'first solo' of 2014 with Dan Cash (on a PPL to Solo course) soloing in KLA - congratulations. With a fairly stiff breeze and reports from the west that there was wave in the sky, a number of members were encouraged into the air to sample this strange and (for some!) elusive lift. Also spotted on the airfield was a pair of flying Gatfields, after MiniGat had delivered a Bronze lecture in the clubhouse on Operational Procedures. Well almost; here is a pic of Mr & Mrs Todd, errm sorry, I mean Mr and Mrs Collett, watching the air display (outside Turville church ) provided by some of their friends from White Waltham on Saturday afternoon. 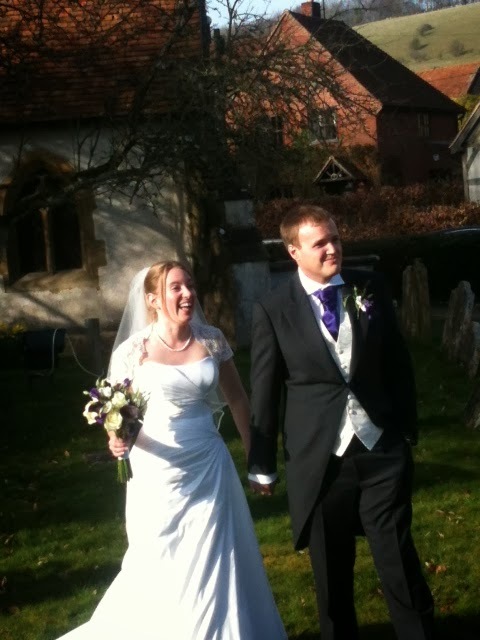 Mike and Emily finally tied the knot on Saturday afternoon with a wedding ceremony in Turville. 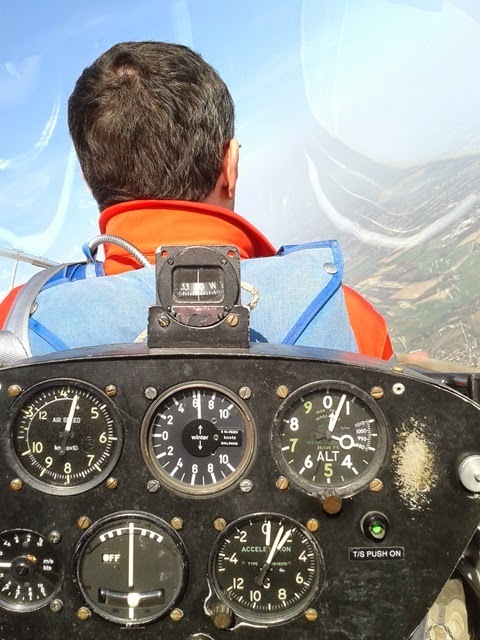 For those really new to Booker Mike was, until recently, the CFI and still flies HA and Emily was an instructor at the club but now mainly flies aerobatics. On the home front the excellent cross country day didn't quite materialise, too much cirrus, too much wind, though the air mass was very unstable. The instructing was fun in a stiffer than forecast southerly crosswind. Great for practicing cross wind landings though. The sunshine brought everyone out today, the launch point was busy until dusk. Amongst our trial lesson customers was Brenda, who at 80 is still enjoying life. She came along with her new husband and his family, they all had a flight, and Brenda trumped them all by experiencing a loop. Just shows it's never too late. Amongst the private owners, John rigged and flew his new turbo Ventus - his syndicate partner Steve meanwhile was working his socks off running the day's flying. The sky provided great views all day and ended with a spectacular sunset. It looks as though the Sydney Opera House has got itself into this cloudscape. Cadet George demonstrating a good lookout. The mud didn't stick to KLA, it was so highly polished, thanks to Vic who has been working hard in the glider workshop helping Robin with annuals.